If you want a unique gift for friends and family this holiday season, how about an adult-themed beer advent calendar? Here are a few options for those with beer lovers on their lists. 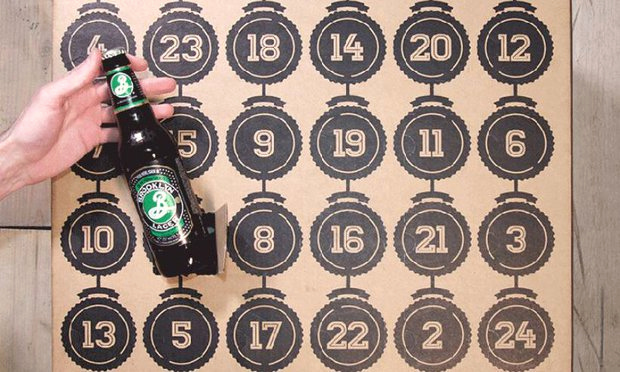 The Craft Beer Advent Calendar is available for ale enthusiasts in British Columbia, Alberta, Saskatchewan, Manitoba, Ontario, New Brunswick, and Newfoundland. The types of beers in the 2018 edition are a “closely guarded secret” but will feature strong ales, imperial stouts, porters, bitters, blond ales, and more. Behind each removable window will be 24 one-of-a-kind, specially selected crafted beers from 12 countries “that you won’t find anywhere else in Canada.” Tasting notes and backstories are included for each beer with information updated on the BeerAdvent Facebook page. It’s recommended that you remove the selected beer from the calendar each day and put it in the refrigerator for a couple of hours before consuming it. To find a list of stores carrying the calendars, visit craftbeerimports.ca. Another option is Ottawa’s Craft Holiday Beer Calendar. Twenty-four mystery beers are featured in the advent calendar with selections from 12 breweries in Ottawa: Nita Beer Co., Whitewater Brewing, Brasserie Tuque de Broue Brewery, Kichesippi Beer, Covered Bridge Brewing, Crooked Mile Brewing, Vimy Brewing, Cartwright Springs Brewery, Broadhead Brewing, Stray Dog Brewing, Whiprsnapr Brewing, and Clocktower Brew Pub. The 473 ml cans of beer are numbered one to 24 and are meant to be consumed on the corresponding December date, leading up to Christmas on Dec. 25. Nita received a Manufacturer’s Representative License from the Alcohol and Gaming Commission of Ontario. Advance orders are required for the calendars, which will be delivered to Ontario residents via Canada Post. Check out the ordering page on the Nita Beer Co. website. But act quickly: orders will only be accepted until Nov. 10. If you’d rather have more control over the selections in a beer advent calendar, you may want to consider the Craft Advent Box, which allows for personal customization. The box is made in the United States, but it ships to Canada and other countries around the world. But take note: the calendars do not include the beer. You fill it yourself with standard 12 oz bottles and 12-24 oz cans. Not sure what type of beer to include? Check out bottle shops that sell craft beer and ask if they sell singles or are willing to break up four and six packs. Or you could team up with some friends and split up the beer. The company has also teamed up with local bottle shops that can fill the calendar and help you pick out what should go inside.